Happy Wednesday folks! We closed out wedding season this past weekend in the gorgeous, and HOT, L.A. It was nice to be in California and away from the brisk temps! For our final wedding of the season I wore probably my favorite dresses of the YEAR! 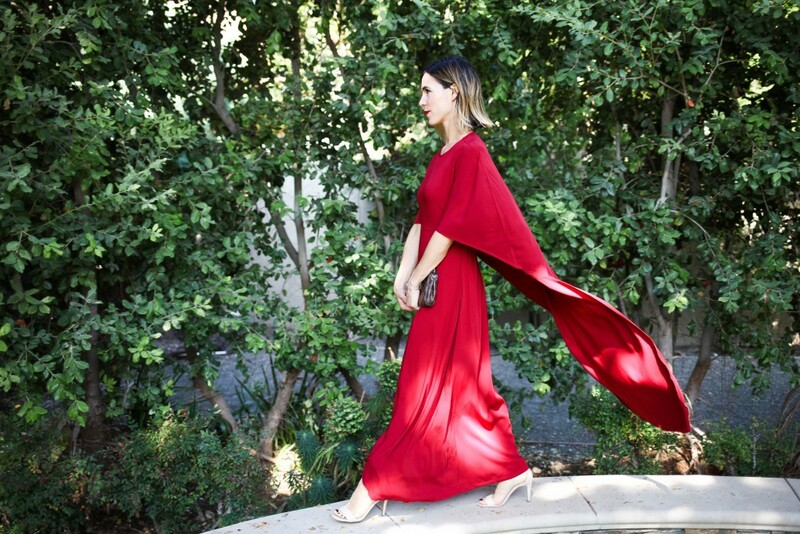 I wanted something different and little unconventional to wear to this wedding and I found exactly what I wanted at Choies – this red cape back maxi dress. 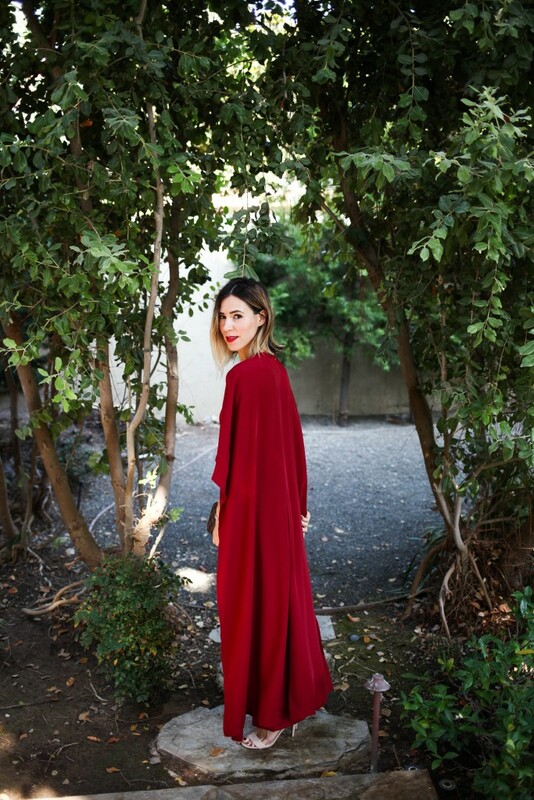 It was compromised of my two favorite fall covets: the wine color and a cape. I’m right there with you – 6 weddings this year and I was a bridesmaid for two of them. My year consisted of bachelorette parties, bridal showers, and weddings. The only thing I didn’t have to stress about were my outfits – thanks to your posts and advice 🙂 It’s like you did the shopping for me! We had our wedding season at one time where all we did was go to friends weddings and now everyone is married with babies. 😉 This dress is all kinds of AMAZING and you wear it sooooo well! This dress is spectacular and you look fantastic! And the price? Wow, great find! you are beautiful and that cape dress is awesome! seriously a stunner piece. your red lip is the icing on the cake. You look stunning! This red is beyond. Ummm WOW! I’m in love with this dress, and I absolutely, positively, 100% cannot believe the price of that dress! It looks very expensive…you wear it flawlessly! This is your color! I always love when you wear red, because it looks stunning on you! I don’t think I could ever pull this off. 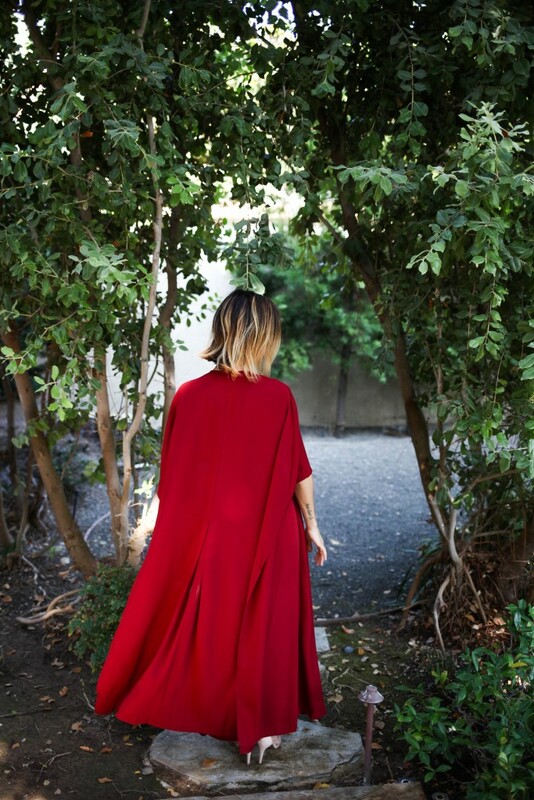 And I love the cape on it! 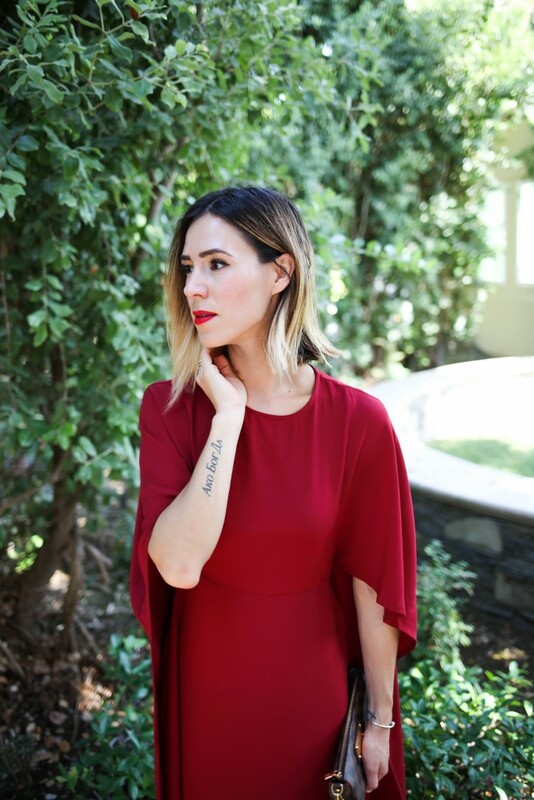 The wine color is so pretty and that cape detailing is a fierce detail! love it! That is an amazing color on you! Such a gorgeous dress….I just graduated college and 4 of my friends are already engaged. I’ve got 3 weddings to go to next summer…this is going to be a crazy next few years for me! What. A. Dress. This thing is gorgeous and it looks amazing on you. You are definitely rocking this look, lady! WOW! I think I need this dress RIGHT NOW! 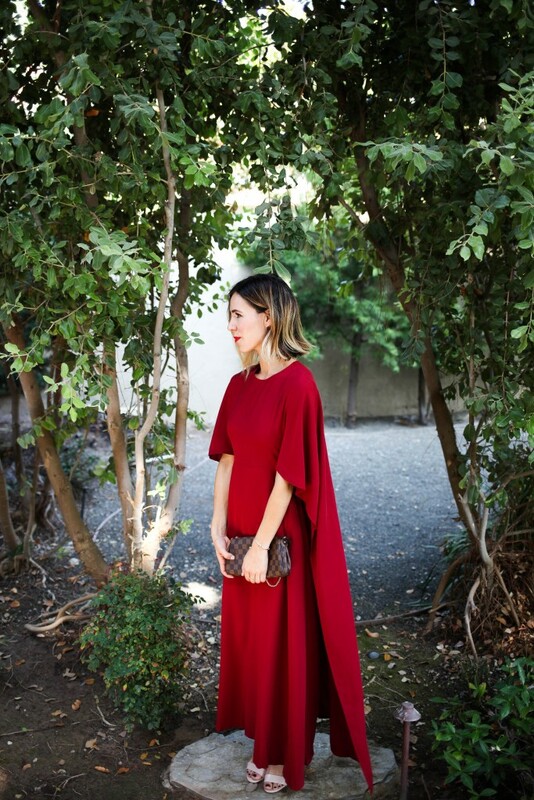 I have been searching for something like this every since I saw Lupita Nyong’o rock that gorgeous red Ralph Lauren Cape Dress on the red carpet and this totally looks like it! Love.Love.LOVE! Your dress reminds me of Solange’s wedding dress. You look amazing!! This dress is so unbelievably gorgeous! Need! p.s. You make me want to cut my hair. No way, that is from Choies???? OMG! You would never be able to tell! It looks like something from a movie! I hope you have somewhere to wear that beautiful dress!! So chic! This dress is everything. Love the color. I simply want to say I’m new to blogs and absolutely savored you’re website. Almost certainly I’m likely to bookmark your blog . You certainly come with terrific articles and reviews. Thanks a bunch for sharing your web page.